And then frustration set in. Local business man Jason Liff started Motoscooto on Wayne Avenue at the height of gas prices- and since then, prices have been dropping steadily- as unemployment has gone up. His selection of quality scooters has improved- adding the Genuine Scooter brand and CFMoto to a line up of LinHai and Fly Scooters. In a conference call the other day with some other Genuine dealers, he found out that their bread and butter scooter sales is in a scooter he can barely sell- the 50cc variety. And it comes down to State laws- with Ohio having some of the most byzantine of options. In many states (note, I can find a definitive list for Mopeds, but not for scooters) two wheel vehicles under 50cc’s don’t require anything but a valid driver’s license – and if they have pedals, may not require a license at all if they can’t go over 30 mph. In Ohio we’ll allow a 14 or 15 year old on the road with a Moped- with a “probationary license”. Yet, we don’t require a motorcycle helmet or the completion of a motorcycle safety course for adults, we require a Motorcycle license to ride anything without pedals. This adds a level of bureaucracy that severely hampers sales of the most energy-efficient scooter- the 50 cc- which all get over 90 mpg. 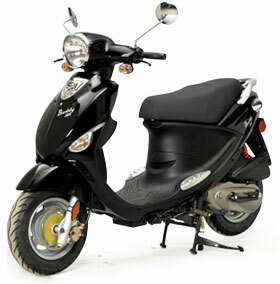 Buyers realize that if they have to get a license- they may as well opt for a 125cc or larger scooter. The quickest and easiest way to reduce the need for foreign oil is to use less of it. Inexpensive, quick, fun, 50cc scooters are a huge step in the right direction. Because California banned the 2 stroke scooter- unless it meets its tougher emission status these small scooters can cut oil consumption and emissions. If we all just took 10% of our trips by scooter- in the summer months- the effects would be … (I’ll leave it up to our math quant reader to calculate the impact). Other laws should also be changed: free parking of scooters in garages, on sidewalks (as long as they don’t impede pedestrian flow) and permissible use of bike lanes- with cyclists getting preferred rights- can make this a more scooter-friendly nation. In Europe where gas prices have been in the $7 gallon range for a long time- scooters are everywhere, year round. The Federal government has already standardized driver’s licenses and forced States to comply with drinking ages, and your driver’s license in one state works in others- it’s time to put a nationwide standard for scooter licensing, with incentives for scooter commuters. Our dependence on foreign oil is an issue of national defense- it’s time we tried the 50 cc solution. Previous Post: But does city hall listen? Employee cost saving suggestions ignored? The Bureau of Transportation Statistics has a page of stats on all sorts of US transportation stuff. I used their Table 4-22 to make this graph of historic fuel efficiency for cars and motorcycles and this ‘what-if’ graph for comparing reality to 10% of the passenger-miles being on motorcycles. To put David’s 10% goal in perspective, historically the amount of annual passenger-miles on motorcycles has been ~0.5% that of the passenger-miles in cars (see this graph, note the semi-log scale). Is motorcycle driving the answer to reducing our dependence on foreign oil (darn, dirty Canadians!)? Probably not (recall Jevons), those foreign devils aren’t going to suddenly want to stop pumping and selling their product no matter how we get groceries. So most likely, the petrol would go towards other uses rather than transportation if we all started riding motorcycles and scooters. I’m glad you brought this up David, generally people think of the gas pump when someone says foreign oil dependency. Two of the products most used in America, plastics and fertilizer are totally manufactured from petrol, high five @jstults & Jevons. So in reality it doesn’t much matter if we walk to the store or drive an Escalade, we bring it home in a plastic bag, stuff it in our mouth, carry the plastic packaging out in a plastic bag and toss it in our plastic refuse container, we are literally eating the petroleum, like it or not. It’s kind of like BP trying to keep us focused on the fix of the week rather than consequence. No mater how much we try to recycle, we burn more petro driving around to collect it. We now incorporate more plastic in cars to make them more fuel efficient. I believe the term is entropy runoff. The Old Bandito wishes Jason Liff nothing but success. A business associate purchased said vehicle from Motoscooto and not only swears by the vehicle, but spent top dollar to have it pimped out with a custom paint job. Fun to ride without the baggage of 1200ccs, the associate declares. But complaining about bureaucracy while simultaneously pushing for a national law to encourage these vehicles? How very David Esrati……. David Erati? Perhaps the Old Bandito should have worn a helmet…. Drop the “s”, add a “c” to the end, and it’s “eratic”– emphasizing your point. I recall looking at scooters at the flea market in Monroe and thinking “those engines look bigger than 50cc”. The nameplate said “49cc” though… Looked closer at the engine itself and it listed it as over 90cc (stamped on the case). Knowing the moped laws and that “49cc and under” didn’t require a motorcycle license, I knew what they were doing. His selection of quality scooters has improved- adding the Genuine Scooter brand and CFMoto to a line up of LinHai and Fly Scooters. @Jstults- because Vespa’s are really expensive. The first scooter Genuine came out with- the Stella- was a Vespa P150 made in India off the same molds. It was a lot cheaper- and actually more reliable than the Italian one. There are people who will buy a Vespa- without ever looking at the alternatives. Me, I’d ride a Genuine Scooter Buddy 150 any day- if I didn’t have the old dependable Yamaha Riva 125 that I bought years ago for $720. And btw Jstults- scooters get 2 to 3x better gas mileage than Motorcycles- so your graphs need a bit more tweaking. Great post David. Ohio laws are very confusing regarding mopeds and scooters. In Indiana, a 50cc scoot can be driven with helmet by anyone with a drivers license. Proud owner of a 50cc and two 150cc scooters…Long Live The Scoot! Bring on $9/gallon gas! if you ask me electric cars are the way to go. leave the decision making up to the power companies. solar, hydrogen, wind, nuclear or what ever. Just need to fix the charging problem. I think you’re missing the next big thing in transportation in the face of Peak Oil.